Was she saying that because she thought that was what he wanted to hear? 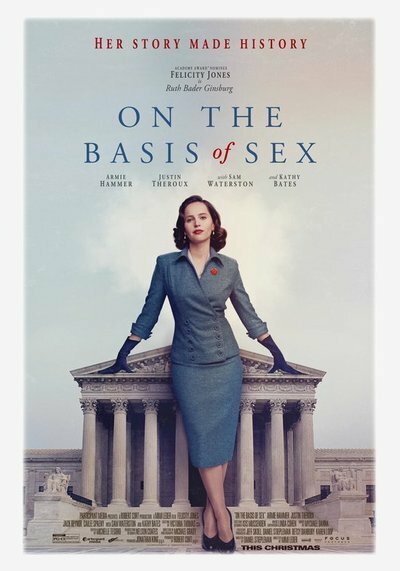 This movie, written with great affection by Justice Ginsburg’s nephew, Daniel Stiepleman, does not tell us. What it does tell us is that she would be understanding, at least some of the time, but never really patient. Before she was known for her feisty dissents, power work-outs, and “Gins-burns” portrayal on "Saturday Night Live" by Kate McKinnon, Ruth Bader Ginsburg was the pioneer litigator who argued cases that were as important to women’s rights as Brown v. Board of Education was to the rights of racial minorities. And she would have two more run-ins with Dean Griswold, each less patient than the one before. And then, he finds a case—a tax case—that gives her that opportunity. The tax law would not allow a deduction for the expenses of an unmarried male caregiver, only a female. She sees that the best way to overturn laws that disadvantage women is to take on one that disadvantages men. It was probably just an oversight; the writers of the tax code failed to consider that an unmarried male might have the care of an elderly parent. But Charles Moritz (Chris Mulkey) did. And the government, under the direction of Dean Griswold, now at the Justice Department, made three very big mistakes. Instead of amending the rule, they decided to fight. They underestimated Ruth Bader Ginsburg. Jones and Hammer make an appealing couple, and they get strong support from the more colorful characters, like Kathy Bates as pioneering feminist attorney Dorothy Kenyon and Justin Theroux as Mel Wulf, legal director of the ACLU (and Justice Ginsburg’s former campmate, as we learn with an adorable musical number). Director Mimi Leder has an eye for telling detail and a sure sense of pacing, especially in the scenes with the Ginsburg’s teen-age daughter Jane (Cailee Spaeny), whose own spirited feminism shows her mother that it is time for the law to catch up with the culture. Stiepleman’s affection for his aunt and license as an insider are palpable as he gently, perhaps too gently, teases her seriousness of purpose, her discipline, and her legendarily awful cooking. In one telling moment, Martin steals some leftovers from the baby’s high chair tray rather than eat his wife’s tuna-onion casserole. (He later switched over to cooking all the family’s meals, and Hammer shows off some Great British Baking Show-worthy knife skills.) Ginsburg's determination never falters, but it is moving to witness her growing realization that the world is catching up to her vision, and is ready for her voice.